Here are a few published texts that are also helpful in sorting out Lewis’ editions. 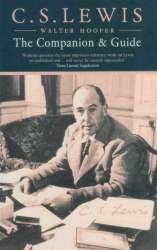 Walter Hooper’s C. S. Lewis: The Companion & Guide offers a substantial section on publication histories of Lewis’ books up through 1996, the year of its publication. Though dated and incomplete now, it is still a valuable addition. You can also find it in ebook or used. A number of websites exist that are helpful to collectors and researchers interested in the publication histories of Lewis’ edition. Although none present as exhaustive a treatment of Lewis’ English editions as The Disordered Image, some offer information not contained here. The Official C. S. Lewis site lists the currently published editions (including ebooks) from HarperCollins. This is as close as we’ve come to a “complete works of C. S. Lewis” so far. You may get better prices at Amazon or ABE books, but as a catalog, it is helpful. Glen GoodKnight’s site Narnia Editions & Translations offers a less expansive view of Lewis’ English editions. He has, however, cataloged all of Lewis’ foreign translations as well. Sadly with his passing, the site is only current through 2010, and contact links to not appear to be active or monitored. Facsimile Dust Jackets LLC offers reproductions of a number of dust jackets from Lewis’ first editions. So if you have a first edition without a dust jacket or just want a souvenir, check them out. While it’s not exactly interested in publication histories, Smilde’s Lewisana site offers some of the most complete “notes on Lewis’ volumes” we’ve found. The Marion E. Wade Center in Wheaton, IL is the largest repository of Lewisana in the western hemisphere (and arguably the world), and is both a first and last stop for questions on Lewis editions. Approximately half the images posted at The Disordered Image were collected from the Wade with our deepest thanks! Goodreads appears to have spent some time chronicling Lewis’ editions. This sample is from The Horse and His Boy. There is no order to the editions, but foreign languages and other editions appear to be included. Do you know other websites that are particular useful when looking into Lewis’ editions? Drop as a note with the address.